Today, Sunday, December 12, there is a special feast day celebrating Our Lady of Guadalupe. The image above was what appeared on Juan Diego's tilma when the bouquet of roses cascaded down from Juan Diego's cloak as he was showing others who were skeptical about his story. Last year our family went to Mass to celebrate this feast day at a church named "Our Lady of Guadalupe". The altar was filled with hundreds and hundreds of roses and was so beautiful. When our Blessed Mother appeared to Juan Diego at the hill of Tepeyac, there was a field of roses where roses did not bloom before or during the season of winter when roses do not bloom naturally. Hence, when people celebrate this feast day, many decorate their homes and churches with roses. After Mass last year we ate at a Mexican restaurant and we went last night to a Mexican restaurant with 6 adults and 13 children! (3 families total). I brought a candle with the image of Our Lady of Guadalupe on it and burned it during our dinner to help celebrate such a special outing with family and friends. 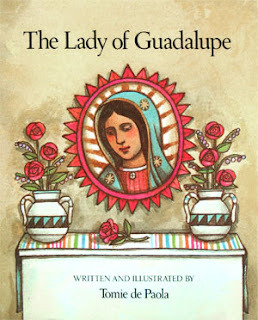 We enjoy reading The Lady of Guadalupe by Tomie de Paola each year because Juan Diego's story about how he was blessed by Mary's presence is too miraculous not to share with my children. When I read this book, I am always so impressed by the great faith and persistence Juan Diego had even when others doubted his story and experience. 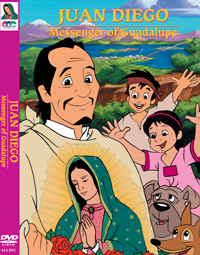 We also watch the CCC video, Juan Diego-Our Lady of Guadalupe, sometime between St. Juan Diego's feast on December 9 and Our Lady of Guadalupe's feast day on December 12. Would you like a chance to win this DVD? If so, Lacy at Catholic Icing is hosting a giveaway for one reader to win this DVD. You can go to her post HERE for more details and to enter! The image from Juan Diego's tilma is on display in Mexico and has not deteriorated since the 1500s when the image first appeared. There are many other miraculous facts about this image that my dad shared with me through an email attachment, but I am unable to link up the attachment on this post. But, if you are interested in receiving the email attachment please Contact Me and I will be more than happy to send you the information. 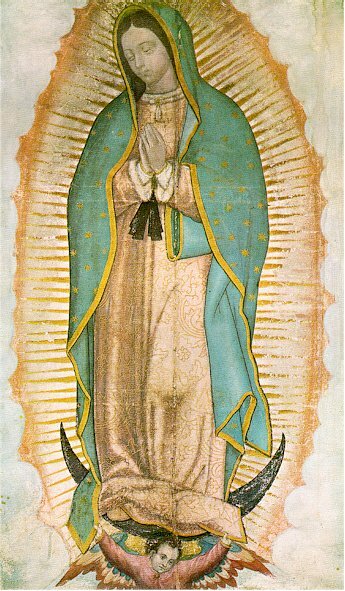 You can also read "Our Lady of Guadalupe ‘completely beyond' scientific explanation, says researcher", which is an article that explains how researchers to this day say "there is no scientific explanation for the 478 years of high quality-preservation of the Tilma or for the miracles that have occurred to ensure its preservation. " I give Joy to the World when I share how God works in mysterious ways! I'm glad you are finding my posts interesting and hopefully insightful :) Thanks always for your support and encouragement ! Wow, your parish altar is amazing with all the roses! Neat to see what other parishes do to celebrate. We love those same resources you so beautifully shared. Thank you and Ave Maria! We are the only Our Lady of Guadalupe parish in the Raleigh Diocese. There is one other in western NC at the mountains. What a great surprise to "see" you in blog world! How did you find this blog post of mine? Thank you for your parishes website and I miss your beautiful church and wonderful priest!